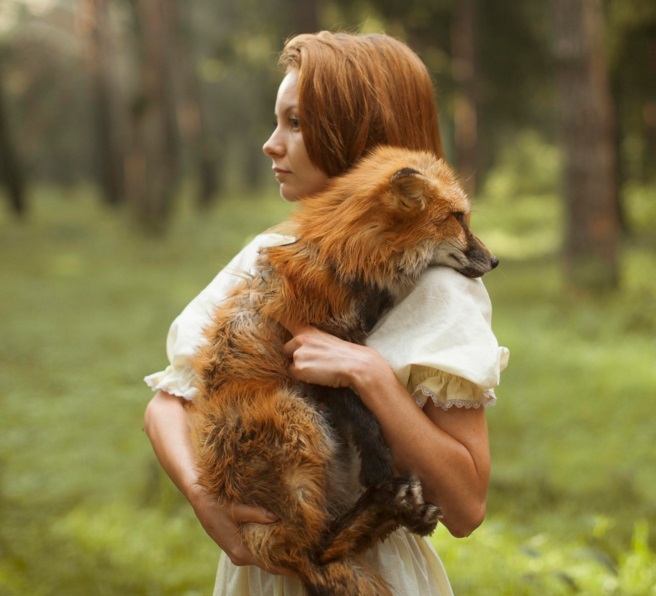 Despite only discovering her passion for photography seven years ago, Katerina Plotnikova’s enchanting and ethereal photographs have already taken the world by storm. The Moscow based creative has a following of over 600,000 people on her Facebook page alone, with this figure increasing dramatically on a daily basis. 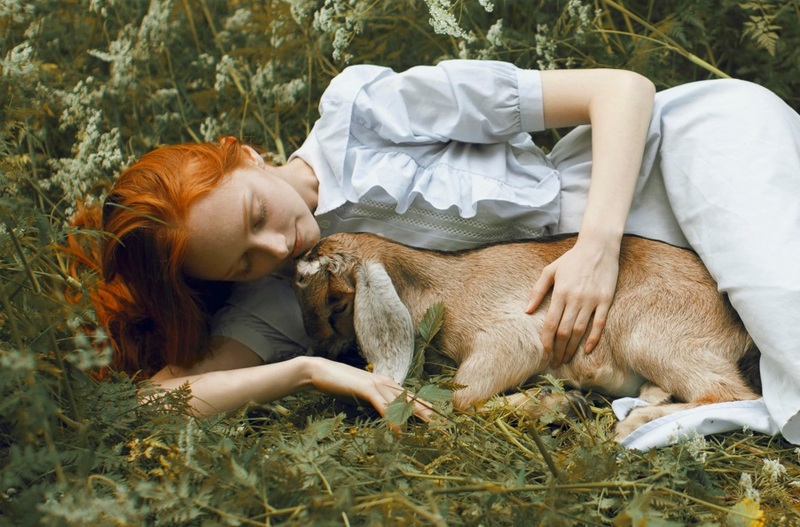 When it comes to her work, it is her images featuring animals (just like this photo shoot) which have perhaps gained her the most attention. The staggering reason behind this is simple: Katerina has not used Photoshop to add in any of these animals – they are, indeed, captured like this ‘in real life’. 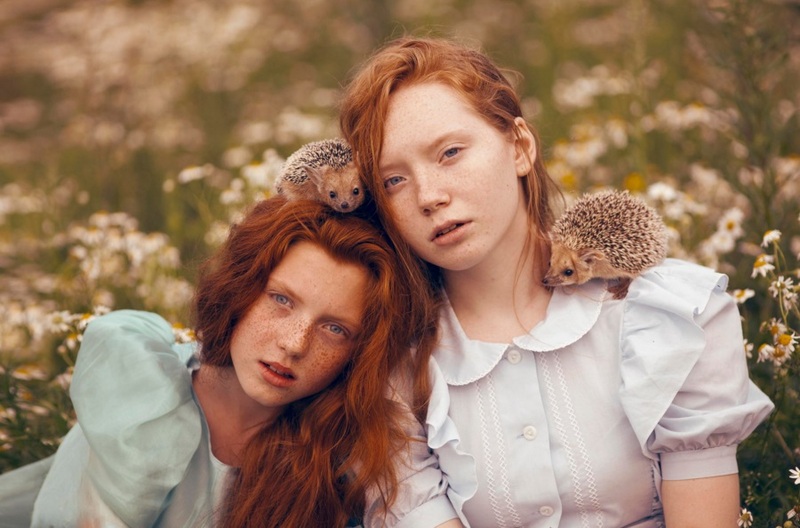 From a bear gently touching the model’s hand to foxes enjoying cuddles and hedgehogs comfortably perched upon shoulders; the world that this young photographer lives in is certainly a magical one. When it comes to this photo shoot, it is important to note that Katerina used well-trained animals while their professional trainers were present at the scene. Along with a lot of patience and some much-needed caution, the photographer was able to successfully produce these amazing results. 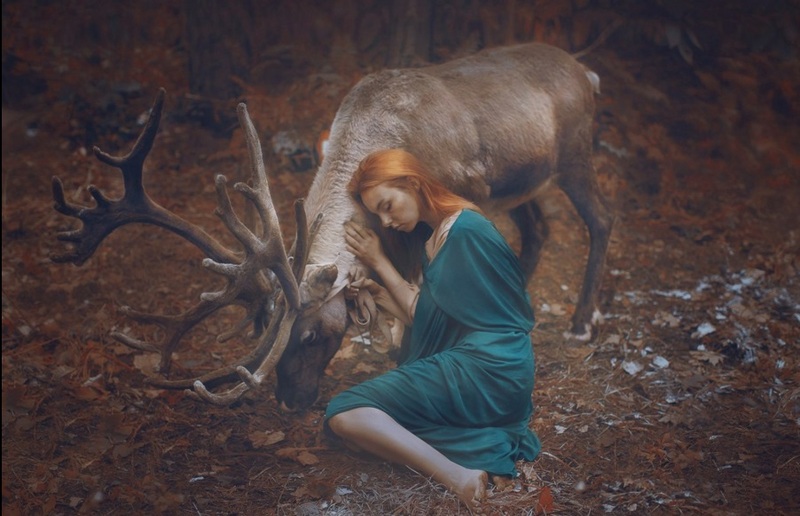 Katerina recently shared an insight into this series in an interview with SLR Lounge, revealing that the deer was incredibly difficult to photograph sitting still, as it constantly wanted food. Alternatively, the bear was easier to capture images of, as he is a trained circus bear who loves people. Photography has become a part of me. The whole time I could think about to implement a new design. Where can I find a pet deer? How do I get to a chair on the tree? How do I make a swing hanging from the sky? When it comes to Katerina’s beautiful, auburn-haired models, the photographer explained that she has always been drawn to this ravishing shade. [I] always had some special thing to red hair. Also, when I was in sixth grade, I painted my hair (which was a big surprise for my parents). And now, perhaps, it is really a fetish. 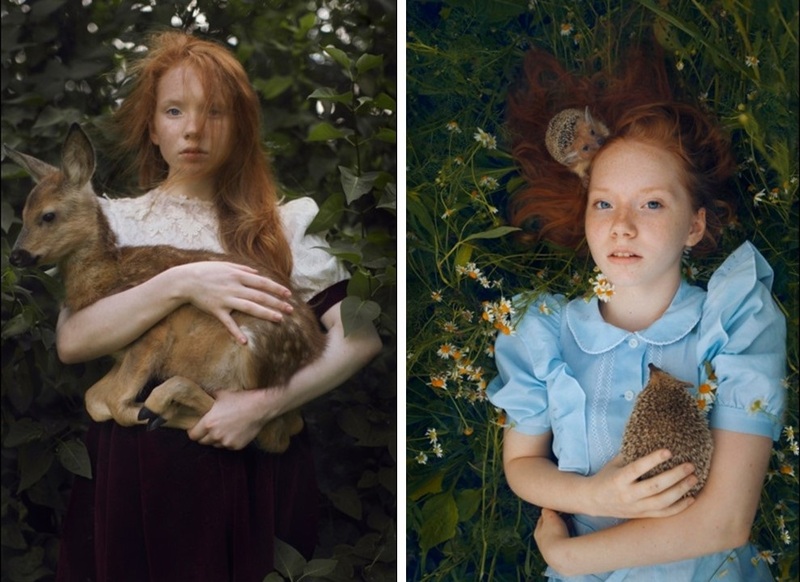 The inspiration behind this series of images, as well as Katarina’s other photo shoots featuring animals, is really quite simple. The photographer looks to elements such as nature, travels, and emotions to find new ideas for her work. 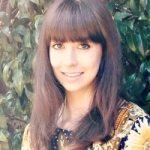 She also finds inspiration when perusing around DIY stores, stating that it is “a great exercise for one’s imagination”. 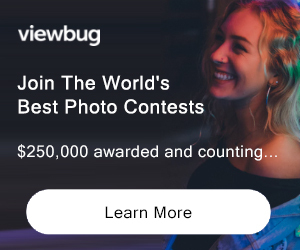 These images also have a very Leibovitz or Tim Walker feel to them, mainly due to the fact that Katerina lists both of these famous photographers as her biggest inspiration and motivation. Similarly, her images transport the viewer into a dream world, where enchanting tales seem to come to life in front of their very own eyes. 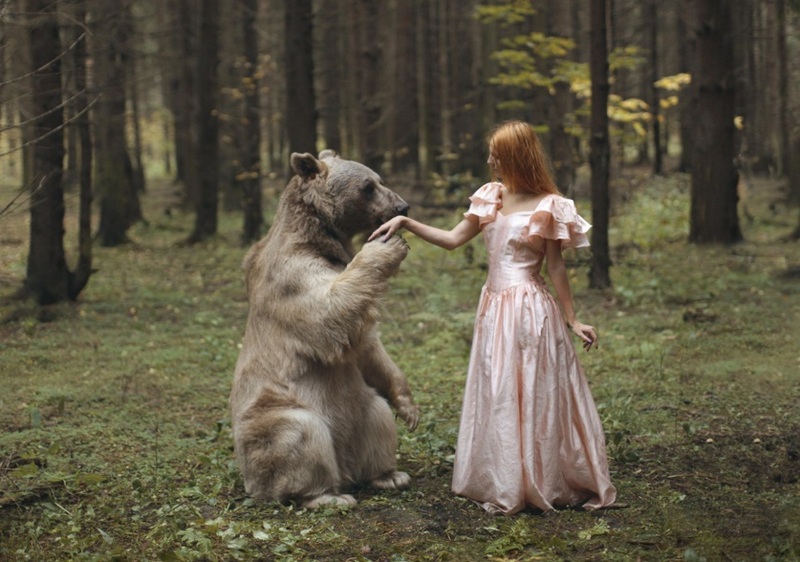 Despite Katerina wanting to try her hands at fashion photography next, viewers will probably agree that it is her series featuring these incredible animals which truly set her apart from other, equally-as-talented photographers. To view more work from Katerina, you can visit her 500px website and Facebook page. JOIN OVER 100,101 and receive weekly updates!